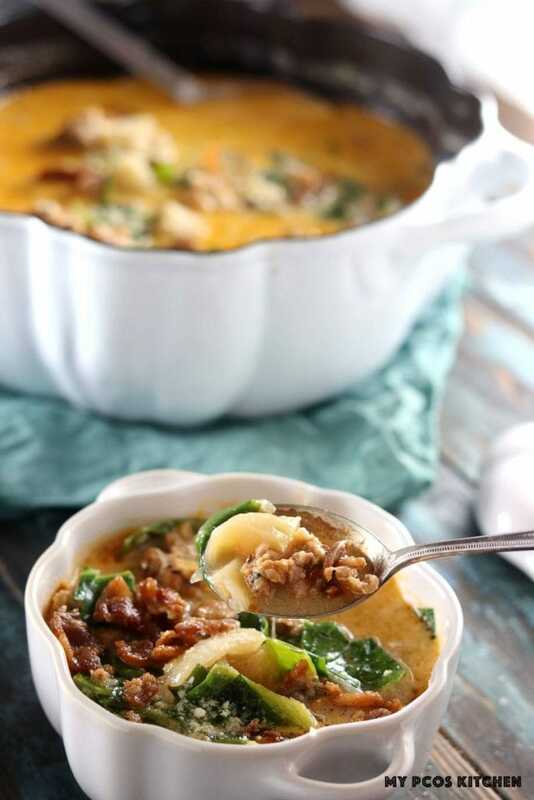 This delicious Low Carb Copycat Olive Garden Zuppa Toscana tastes just like the original but uses low carb, keto and paleo friendly ingredients. 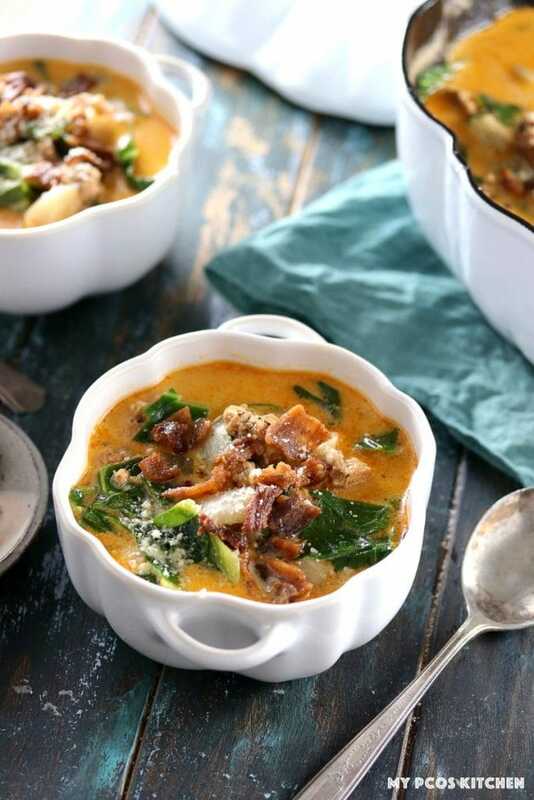 This Olive Garden Zuppa Toscana recipe could not be easier! This soup doesn’t require many spices, only uses a couple of vegetables and the flavour mostly comes from the meat and broth. I used some homemade chicken broth that I had made and finished it with a cup of heavy cream. For a paleo Zuppa Toscana, you can switch the heavy cream for almond milk instead. Actually, any kind of nut milk would work for a dairy free zuppa toscana. I bet macadamia would taste lovely! I also think some coconut cream could taste pretty good in this! I like my soups to be more hearty than liquid. I love to add lots of vegetables and meat and just a little liquid. For this copycat Zuppa Toscana recipe, I added about 7 cups of liquid with a whole lot of ingredients. If you like your soups to have a more liquid consistency, then you can up the liquid ratio. Just be sure to add a little bit more salt at the end. The homemade chicken broth that I used did not have any added salt so just taste test until it’s the perfect saltiness for your palette. I used to love buying sausages when I lived back in Canada. My father always used some in pasta dishes, especially the spicy kind, and I used to eat all kinds of different flavoured ones. They aren’t very popular so I usually have to make homemade Italian sausages! My sausages this time consisted of some paprika, onion and garlic powder, salt and pepper and lots of cayenne pepper and chili flakes. You can decrease this as you wish as I like my sausages pretty spicy. I was originally going to do an all-pork sausage, but I didn’t have enough in the fridge so ended up doing half chicken and half pork. They tasted delicious either way and I bet you could make them into sausage patties to have them for breakfast! I have another neat recipe for breakfast sausages where I stuffed them in muffin cups, added an egg and baked them in the oven. You can check out these Breakfast Sausage Cups right here! My version of this soup ended up pretty orange in colour because of all the paprika and cayenne that I added my homemade Italian sausages. If you use store bought sausages, then you can expect your soup to be a little bit more white in colour! When making homemade soups, I’ve always loved to add starchy ingredients like potatoes, pasta or beans. 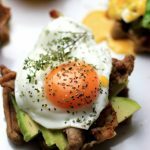 I found that the greatest low carb replacements for those are either turnips, butternut squash or even sliced radishes. This low carb Zuppa Toscana uses low carb and keto friendly vegetables with lots of delicious crispy bacon and homemade low carb sausages. Just like in this Grilled Chicken, Bacon & Radishes recipe here, I replaced the potatoes for radishes. I love to cook with turnips because they taste exactly like potatoes, but healthier. They taste amazing in soups and stews and don’t require a long cooking time. In Japanese cuisine, they’re often substituted in beef stews or used in stir-fries. When you put them to boil, you only need to boil them for about five minutes and they are done. They get tender real fast and can be overcooked instantly, so you do have to be careful when making soup with them. When you make this Olive Garden Zuppa Toscana soup, it’s important that you fry your bacon separately and crumble it on top of you bowl of soup at the end because pork belly tends to get soggy in liquid. So first, fry it all up until nice and crispy and just top it over your soup when ready to eat. 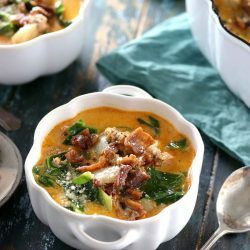 Of course, you could add your crispy bacon directly into the low carb Zuppa Toscana if that’s the way you like it, but I prefer to keep my bacon crispy. 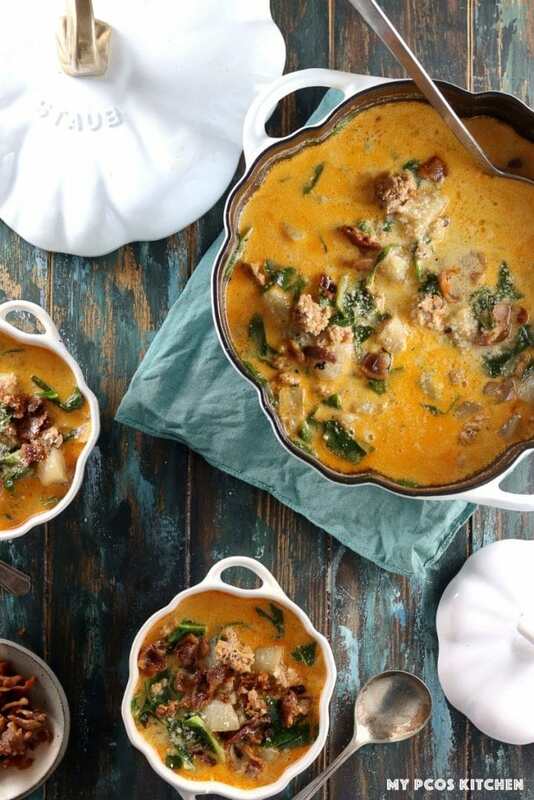 The carbs in this keto Zuppa Toscana recipe come directly from the vegetables. Onions, turnips and kale have quite a high amount of carbs, but they also do have a decent amount of fiber so it does equal out for me. 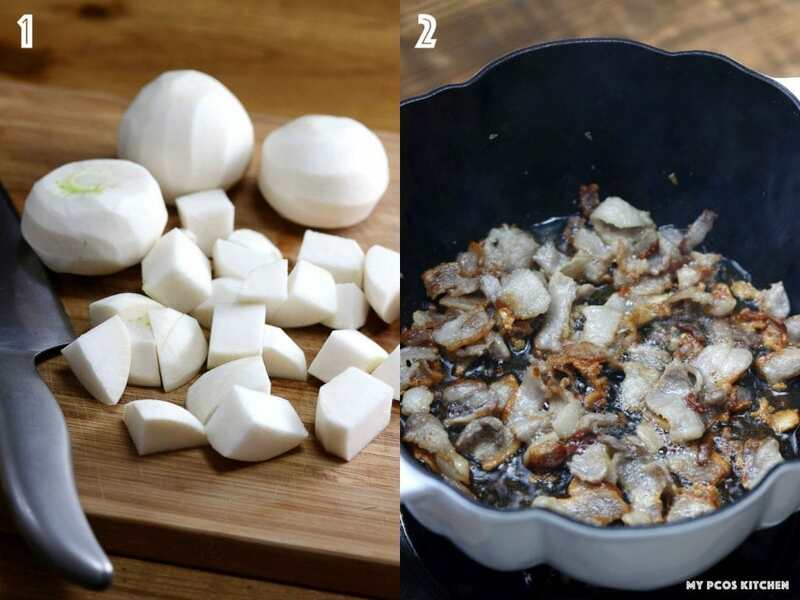 I think this recipe is more suited towards a low carb diet rather than a keto one, but you could also cut back on some of the onions and turnips to make it less carbs so that it fits your macros. You can also up the liquid to add more servings. The bowl pictured above was one serving for me and was quite filling! Make sure to read the following tips to make sure your recipe comes out perfect. 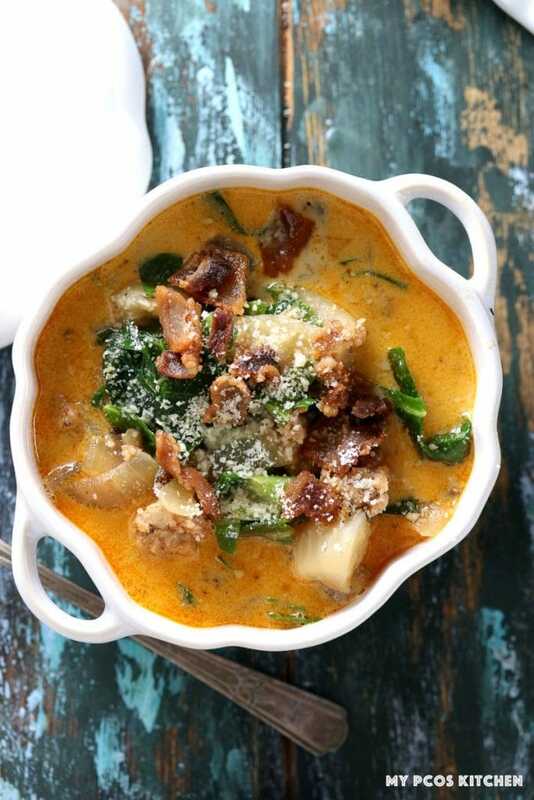 The recipe itself doesn’t require a lot of cooking time as turnips cook pretty quickly, but depending on what style of soup you want to make, I made suggestions for different low carb or dairy free substitutions you can make for this low carb Zuppa Toscana. If you don’t want to make homemade sausages, feel free to use store bought ones. Just make sure they don’t have any sugar in them as that might alter the carb count. The sausages use cayenne, paprika and chili pepper, which is why the soup ends up with an orange colour. You could leave out the paprika if you don’t like the colour, but I thought it added some nice flavours to it. The traditional soup uses potatoes, but for a low carb Zuppa Toscana, I used turnips. You can also use radishes, jicama or butternut squash. 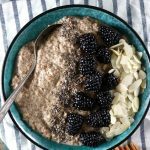 For a dairy-free version, you can sub the heavy cream for either almond milk or coconut milk. The coconut milk will give it a slight coconut taste, though, if you’re into that. Any other nut milk will also work. Instead of kale, you can use swiss chard, spinach or even watercress. If you have some mustard greens where you live, that could also be yummy. I used homemade chicken broth, but any store bought ones will do. If you don’t have bacon, just use thinly sliced pork belly. A delicious copycat recipe that uses turnips instead of potatoes! Peel and dice the turnips. Chop the kale into bite-size pieces. Dice the onion. Mince the garlic. Slice the bacon into 1cm slices. 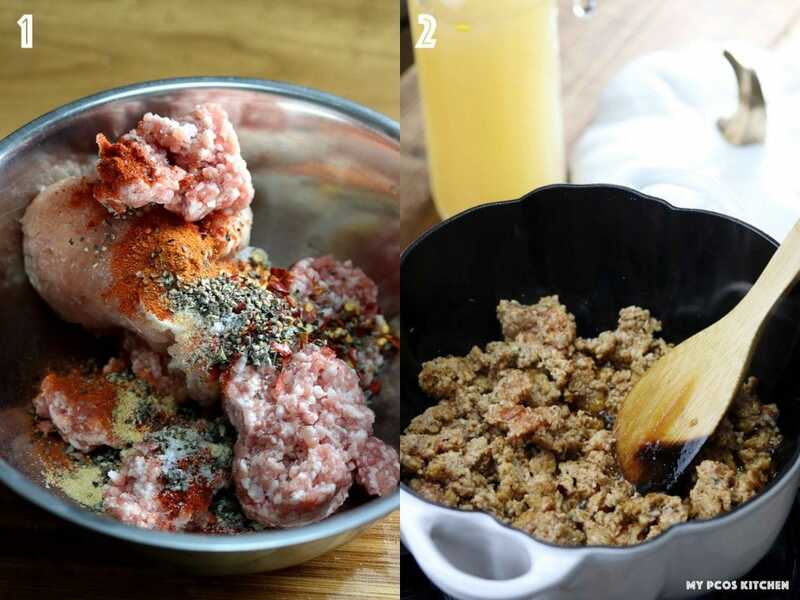 In a bowl, add the sausage ingredients and mix well with your hands. In a large pot, cook the bacon rashes on medium heat until nice and crispy. Do not drain the excess oil. Transfer the bacon to the side. In the same pot, add the sausage and cook until browned, 3-5 minutes. Set aside. Again, do not drain the leftover oil. Add the chopped onion and garlic to the pot and cook for 3-4 minutes until tender. Add the chicken broth and turnips. Turn the heat to high and put to boil for about 5-7 minutes. The turnips will soften very quickly. Pierce with a fork to check from time to time. Once the turnips are soft, turn the heat down, add the kale and cook until wilted, around a minute. Add the heavy cream, salt and stir. Add the cooked sausages to the pot and stir. The soup is now done. If you think it's not salty enough, just add a bit more. Serve and sprinkle the crispy bacon and parmesan over each serving bowl. Is 1 serving size approximately 1 cup? There’s about 6 cups of liquid in there + the ingredients so a little bit more than 1 cup. Probably 1.5-2 cups. I love this recipe. Reminds me of Italian wedding soup. So delicious!! I made this tonight for dinner and it was excellent! I used spinach and coconut cream as my substitutes. We’ll be adding this to our rotation. Hello! 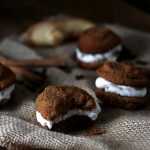 I am excited to try this recipe now that fall is arriving soon! Is there a substitute for the turnips that I could use? Hi Serenity, I mention in the post that you can sub the turnips for cauliflower, radish, jicama or butternut squash. Wow, quelle bonne soupe Mira!